Each year, the migratory monarch butterfly embarks on an extraordinary journey from eastern North America to central Mexico. A multidisciplinary team of scientists has now created a model circuit that finally explains how these insects are able to navigate across such vast distances. Migrating eastern North American monarchs have an internal compass that taps into the position of the sun, allowing the butterflies to maintain a steady northwestern trajectory. Scientists have known about this for years, but they had no idea how these signals are represented in the butterfly’s brain, and how all this information—like the sun’s position relative to the horizon and the time of day—are processed to produce flight control. New research from the University of Washington shows that monarchs are equipped with “cellular circuits” that drive this biological compass. To understand how this navigation system works within the monarch brain, a team led by Eli Shlizerman took their knowledge of monarch physiology and neurology, and they emulated it in a model circuit. The researchers wanted to understand what kind of mathematical voodoo goes in the butterfly’s brain that allows it to convert the incoming stream of data into a meaningful signal that consistently sends the insect in the right direction. Monarchs are equipped with large, complex eyes that scan the sun’s position in the sky. But that’s not enough to determine direction; these bugs also need to know the time of day. To figure that out, monarchs have evolved an internal clock driven by the rhythmic expression of key genes. This “clock” is located in the antennae, and it sends this valuable information via neurons to the brain. With the help of biologist Steven Reppert at the University of Massachusetts, the scientists were able to record these signals as they were being transmitted to the brain, along with the sunlight signals collected by the eyes. The resulting model consisted of two control mechanisms, one to monitor the time of day, and one to monitor the position of the sun. “The circuit gets those two signals then matches them, according to how it’s wired, to control signals that tell the system if a correction is needed to stay on the correct course,” Shlizerman told the BBC. “It shows how behavior is produced by the integration of signals.” The system simply goes into reverse to help with the journey home. In the future, this model circuit could be installed in a robotic butterfly or other robotic insects. 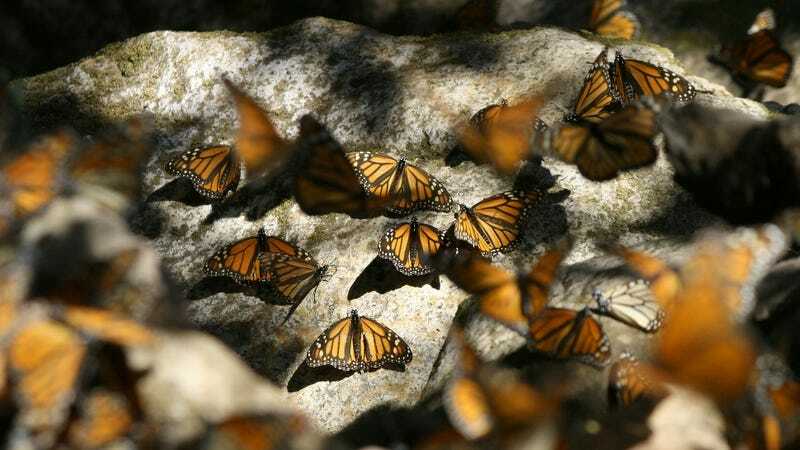 The researchers say these hypothetical mechanical brethren could follow monarchs on their annual journey and track their entire migration. Such a project could go a long way in helping this species, which has suffered significant population decline over the last several years.